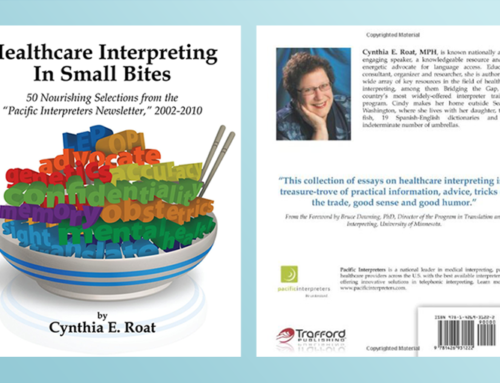 Healthcare Interpreting in Small Bites is the latest book published by Cynthia Roat, known nationally in the field of medical interpreting as a key figure for the development and implementation of Bridging the Gap, the most consulted, and at one time, the most widely- offered healthcare interpreter training program in the country. I use Healthcare Interpreting in Small Bites in the Health Care Interpreter Program that I teach at the University of Memphis, School of Public Health. Because I have found it so useful, I’ve written this review to encourage others to read it as well. In fact, I invite individuals who have used this manual as a textbook and/or as an ancillary book to visit www.tamit.org to share their views about it, and to initiate a dialogue as a professional platform for further book reviews. Bear in mind that the process of selecting which articles I should spend more time reviewing has been a difficult one, since I believe that each chapter merits special consideration. However, in order to keep this short, I have elaborated on sections that my students have requested and found the most beneficial. Has anyone ever told you to eat delicious food in small bites so that you can enjoy the real flavor of the delicacy? Each individual morsel allows you to experience its true essence. I would apply this analogy to the book title and subsequent articles. Take your time with the “flavor” of each chapter, as you would give yourself enough time to enjoy a delicacy, until it dissolves slowly on your tongue. As your start reading the manual, you will realize immediately that Ms. Roat knows what she is talking about. Her careful selection of themes and how she addresses each one of them make the reading worthy of consideration. Already in the first article, it is clear the Ms. Roat has decided to use a conversational style to communicate with us, the readers, and to engage us in the conversation. A conversational style promotes closeness to the reader as it also reminds us of the very nature of medical interpreting, which is, basically, oral communication. The book is divided into two parts, each one containing different sections. Each section is subdivided into chapters, consisting of articles that Ms. Roat wrote between 2002 and 2010 for the monthly “Pacific Interpreters Newsletter.” Part I has 4 sections. Section 1 covers the basic topics of medical interpreting. Section 2 includes specialized topics of medical interpreting, very suitable for a more advanced healthcare interpreting training. The fundamentals of medical interpreting can become dry and repetitive, but in Ms. Roat’s case, she infuses humor and utilizes these “small bites” to facilitate the student’s learning acquisition and the instructor’s presentation of the subject matter. Ms. Roat does not leave anything behind. Well aware of space limitations, she is sure to include the “classics” that every interpreter should know, such as the importance of a pre-session, confidentiality, transparency, note-taking, advocacy, sight translation, and interpreting techniques, to cite a few. “The Interpreter as Advocate-Yes or No?” is a favorite chapter in my class. Advocacy is a thorny topic and a controversial one. There are different schools of thought among experts about when, how, and if an interpreter should advocate. While some cases are straight-forward, others are not so clear-cut. Students struggle to determine if a situation is about cultural interface, advocacy or a principle of benevolence. In order to disentangle this dilemma, I often refer to this chapter. The students and I follow the roadmap delineated by Ms. Roat to differentiate which cases really constitute advocacy and which ones do not. A simple if-then flow chart helps students to visualize differences clearly and precisely, and ensures students have a very clear understanding of what advocacy entails. Not only is the Q&A section in this chapter incredibly thought-provoking, but it prepares students for advocacy-related questions that appear on the national certification exams. I highly recommend instructors and students to consider this chapter. In Chapter 5, Ms. Roat invites us to analyze the semantic implications of the word “helpful” in the context of medical interpreting. Often, interpreters misinterpret “helpful” by switching to the role of the provider. Ms. Roat cautions and reminds interpreters to stay focused on their main role, which is to facilitate oral/cultural communication. In order to assess understanding and proper use of the word “helpful,” Ms. Roat provides a twelve-question quiz with answers included at the end of the chapter. The symbols that she uses to distinguish being helpful from not helpful are well-thought out. I often use this chapter to facilitate a discussion about the role of the interpreter, and then administer the quiz as an activity to be done in pairs or with the entire class. Other chapters worth considering are note-taking, memory and sight translation. The first two chapters are relevant to those in need of improving their skills in doing long consecutive interpreting. The third one is a required reading to master the specific skills of sight translation. With Ms. Roat’s permission, I have made a PowerPoint presentation to help visualize the content, which has proven to be a great learning tool for my students. Section 1 ends with the essential topic of accuracy. Why did Ms. Roat leave accuracy to the very end of the section instead of beginning the book with accuracy, we could ask, given the fact that accuracy frequently appears as the first standard of practice? I believe that Ms. Roat has purposely reserved accuracy to close Section 1 so that the reader will go into Section 2 with a fresh understanding of the importance of this principle. I think that she also wanted to convey metaphorically not to close the door of the room without being sure that conversations have been interpreted accurately and precisely. Another explanation could be that, as in mathematics, the order of the factors does not alter the value of the product or its results. Accuracy is always relevant, no matter the place it occupies in the book! Readers who want to expand their knowledge in healthcare interpreting will be delighted by Part II, which includes an excellent and varied selection of specialized topics, accompanied by Ms. Roat’s expert opinions from having skillfully interpreted in various settings for many years. Their content pertains to challenges and issues that medical interpreters such as ourselves may face in specific settings. As a medical interpreter in a pediatric oncology research hospital, I personally appreciate very much the choice of this topic in the opening chapter. Ms. Roat explains the protocols of interpreting for children and families, how to control flow, the language of children, and tips for interpreters on self-care. Because of the rising interest in this topic among interpreters and students, I encourage Ms. Roat to expand the chapter in her next book. Interpreting in the pharmacy and genetic counseling are especially important topics in the current management of diseases. More and more often, interpreters are called to interpret for geneticists and families. The same applies to the area of pharmacogenetics. Ms. Roat knows that the future of improving the treatment of diseases relies heavily in the genome projects currently being developed. Therefore, interpreters need to be knowledgeable in these specialties through education and professional development. I would invite Ms. Roat to offer additional information in these areas in the next edition of this manual, as well. Behavioral Interpreting is another specialized area where interpreters are often called. Ms. Roat has extensive experience in this subject as well as in palliative care. Because behavioral health interpreting encompasses so much content, she divides this topic into three parts. Compared to other articles, this three-part collection of essays offers a more detailed account of what behavioral health is, what to expect and how to intervene as a medical interpreter. Anyone already interpreting in this field or about to begin, should definitely read these three articles, where they can find detailed and comprehensive information in a well-edited format. Interpreting at the end of life is found in Parts I and II, followed by interpreting prayer. Once again, I would like to stress the appropriate selection of these topics by Ms. Roat. I have personally been asked to interpret for children who were dying or who had died in my presence. Emotionally charged situations, coupled with mastery of accurate frozen language, are very challenging aspects of medical interpreting. Ms. Roat shares her knowledge and experiences with us on how to have difficult conversations on issues such as advance directive, durable power of attorney for health care, do-not-resuscitate order, and organ donation. Ms. Roat even provides an online course on palliative care, which I highly recommend. The last chapters offer practical tips and advice on a variety of topics such as how to train a team of providers, how to handle angry clients or “uncooperative providers”, how to stay healthy, and how to work as a free-lance interpreter. Ms. Roat, who is empathetic about the fear of testing, cheers us up by offering a practical guide on how to prepare for and approach testing. For those who find themselves anxious before taking the national certification exams, I highly recommend this as a resource. Of course Ms. Roat does not want to end Part 1 of the book on a sad note. She gifts us with a poem, written by her and dedicated to interpreters, to say goodbye. What a nice surprise to find Ms. Roat’s versatility with prose and poetry! The poem is all a masterpiece of humor, content and rhyme. It is also hilarious – read it in its entirety! 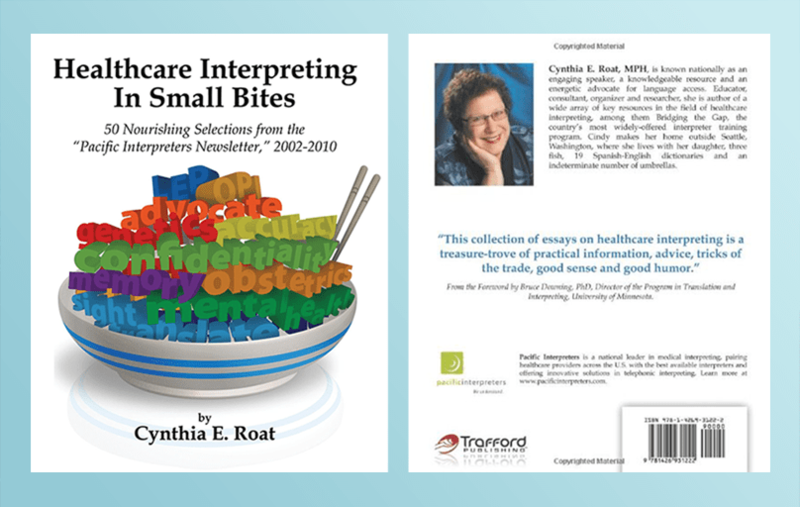 In conclusion, I highly recommend Ms. Roat’s newest book, Healthcare Interpreting in Small Bites. Its excellent topic selection, approachable and humorous style, expert and thorough explanations, and the valuable addition of exercises and activities that complement and expand the content of the chapters, make this book a must-read. I, for one, will patiently wait for Ms. Roat to expand upon her personal experiences in the field of medical interpreting in forthcoming books. In the meantime, I’ll continue to enjoy this latest rendition, one small bite at a time.